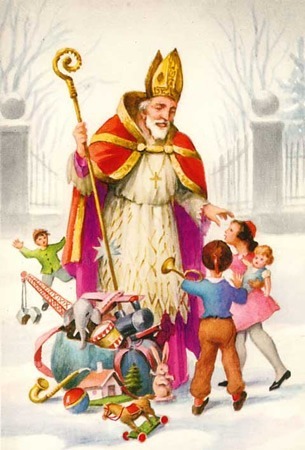 Traditional Saint Nicholas (Polish-Święty Mikołaj). American comedian Jimmy Kimmel has a special segment he does during Christmas time called “I Gave My Kids a Horrible Present.” Basically, parents give their kids unbelievably bad Christmas gifts (such as an onion or an old banana) and film their reactions, resulting in a hilarious display of some very angry kiddos. Watching these children’s reactions for the first time, I could tell that they would never have fit in with the traditional Polish celebration of Saint Nicholas Day, known as Święty Mikołaj, which happens every year on December 6. During this celebration, the gifts reserved for good kids were a lot different than the gifts expected by “good” kids today. And you certainly didn’t want to be on the naughty list. Before I get into that, though, it’s important to understand the background of Saint Nicholas Day. Saint Nicholas, the figure that Santa Claus is based on, was a wealthy Catholic bishop in Turkey in the third century who was renowned for his great love of children. In one famous story there was a father with three daughters. In those days, you could not marry off your daughters without also providing a large sum of money to the husband, called a dowry. Since the father was too poor to marry off his daughters, they were destined to be sold off into slavery and prostitution. Fortunately, they were saved at the last moment when three bags of money fell through an open window (supposedly into a stocking). It’s believed that Saint Nicholas had thrown the money into the home to save these girls from a horrible life. This is just one of the many stories surrounding Saint Nicholas. In most stories he is seen saving children in some way, which is what led to him being honored around the world for centuries to come. He died on December 6, 343, and that day has become known around the world as the feast day of Saint Nicholas. It’s not as big a deal in the U.S. Here, Santa Claus is supposed to come on Christmas Eve. For much of the rest of the world, the magic happens on Saint Nicholas day. This has been especially true in Poland. Long ago in Poland, a man would dress up as Saint Nicholas, wearing a long coat, a mitre (bishop’s hat), and holding a long stick. He would walk through the entire village or town, stopping by each house to test whether children had been good or bad. You’d want to say your prayers to make sure you passed this test. No, really, the test was literally to say your prayers. Remember, Poland is a very Catholic country, and this was especially true in olden days. As a child, the way you proved you were good to Saint Nicholas was by knowing your catechism. If you passed, you would get a gift. Now here’s where the kids on Jimmy Kimmel’s segment would have thrown a monstrous fit. The gifts ranged anywhere from apples, to cookies, to spices. That’s right. Spices. All I want for Christmas is some nutmeg. Ungrateful children should have been thankful that they didn’t make the naughty list. The punishment for not knowing your prayers was Saint Nicholas threatening to beat you with a stick (knowing old Polish custom, I’m sure those threats were realized on more than one occasion). In all, Saint Nicholas Day in Poland was, and is, a holiday rooted in faith and charity. Just like children in the U.S. wait impatiently on Christmas Eve for Santa to come, Polish children look forward to Saint Nicholas coming to reward them for their good behavior. As for those kids who have very precise specifications on what is an acceptable Christmas gift and what isn’t, I think at the end of the day they’d take that onion over a stick-whipping.